My younger brother is two years younger than me and, as long as I can remember, he's been smarter than me. Which, now, is really cool. But when you're little, it's kind of embarrassing. One of our favorite Catherine-was-so-stupid-and-pig-headed moments to laugh about now happened when we were probably about 6 and 8, or maybe 8 and 10. My brother and I are in the car with my parents, and my brother says something, and I'm not really paying attention because I don't understand what he said. A little bit later, I happen to notice that one of the businesses in town has a balloon hanging on its sign, and it's shaped like a little blimp. So I say, "Look, there's a little blimp!" My brother says, "That's what I said." My response was something to the effect: "I know you said something, but that's not what you said." His response was something to the effect: "What I said was 'Look. there's a miniature dirigible.'" I proceeded to have a huge argument with him about whether or not what he said was the same thing as what I said. Sometimes my parents would be upset with us for arguing all the time in the car, but this time, I think they were too busy laughing. So about a month ago, my brother uses the word "provenance" in reference to my grandfather's organ that he was helping me move to my house. I have no idea what he's talking about. "Don't you watch the 'Antiques Roadshow'?" he asks. Well, I do sometimes, but I somehow tend to tune out words that I don't know the meaning of. Words like dirigible. You would think that my brother would know this about me already. So then my brother decides to help me improve my vocabulary and encourages me to use the word in conversation so that I will remember the word. Seein's how it sounds so French, and I'm all about learning French, you would think that I could remember this word. But I don't. I have a really hard time remembering the word whenever I find some opportunity to use it in a sentence. And I see the word all the time now, so I don't know how I missed it before. As an example, here is an article on Wikipedia about a really interesting painting by Jan van Eyck, and the article has a section on Provenance. So I got out my very first stat book from Iowa the other day, and I find an index card with my dad's writing on it. I have a very clear memory of my dad and I sitting at the dining room table at the house we lived in when I was a kid. I really don't know how old I was, but definitely older than 4 and younger than 12, and probably about 10. 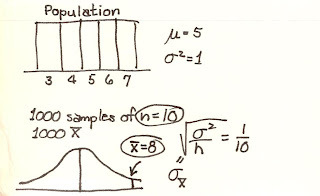 I had asked my dad some questions about normal distributions, so he took out an index card from his pocket (my dad loves to carry index cards and pens with him everywhere), and his black felt-tip pen, and he drew some pictures on that card. And I remember afterwards thinking that the card was really important, because when I grew up, I was going to need to know the normal distribution. So I kept it in a safe place in my room, and the card surfaced when I was in grad school, and I was using it for a bookmark, mostly to help me not be so homesick. I hadn't seen that card in years, and I found it today. And I realized that this is a very important part of my provenance---the documentation regarding my origins. So I called my dad, and I tried to use the word "provenance" in a sentence, and I couldn't remember the word. Sorry about that, brother dear.